Apparently, a lot. It is on an everyday occurrence that I get mocked for listening to bands with less than common names. But is it because people think the band’s name is dumb, or is it because they have not heard of it and immediately dismiss it? I am positive that it is the latter. You see, people will willingly listen to a band no matter what the name is if it is popular and on the radio, and will look for any excuse to shun music that is not on the radio. Why is that? well, I am here to give it to you straight. People are lazy. People don’t want to take the time to find good music. They want to be told what to like. It’s the truth and no one can deny it. I get made fun of all the time because I listen to bands with names like “Creature with the Atom Brain”, “The Gutter Twins”, the “Meat Puppets”, “Beat Happening”, “Love Battery”, and “Mark Pickerel and His Praying Hands”. I was even accused, once, of making “Love Battery” up. People will dismiss these bands because of their name, but will willingly listen to bands with names like “Creedence Clearwater Revival”, “Chumbawumba” (don’t pretend like you didn’t listen to that unbearably awful song of theirs, I know you did. Quit lying. ), “Panic! At the Disco”, “Counting Crows”…well, I have made my point. Two years ago, if I told people that I listened to “PLain White T’s” (I don’t), they would have dismissed it, but since they had a hit song their name is not so stupid any more. So, in order for people not to think that my bands name was not stupid, I would have to get heavy rotation on a top 40 station. Well, that is where the problem is. Unless you are on a major label, you will not be on the radio. Part of the problem is distribution. Radio station want to make money, playing songs that only a limited number of listeners can actually buy would notbe a good way to attract new listeners, or even keep old listeners. The bigger problem, however, is the practice of “payola“, or pay for play. Even though it is illegal, it is still rampant. So people listen to bands with names that are just as “dumb” as the names of bands that I listen to, it’s just that they don’t know it because the shepherd, I mean, DJ tells them which bands are cool, and which ones are not. So when you hear of a band, don’t automatically judge it based on the name, or whether or not it gets “played” on the radio, just listen. If you don’t like it after you listen, fine, but don’t automatically dismiss it. Think for yourselves people. I know it’s hard, but you will thank yourself when you do. After hearing the first song released for this album, “Crawl Like a Dog,” I was pretty excited to hear the rest of the album. However, the album was not what I expected. Don’t misinterpret me, the album is awesome. It is very close to being the best album that came out in 2007. It wasn’t what I expecting in that every track wasn’t such a heavy rock song that “Crawl Like a Dog” was. Each track brought its own flavor to the album. The album started off rocking with “16 Inch Revolver.” The start and top of the rhythm, for me, was a great addition to the song. Each time it stopped and started, more layers were added on making for a very cool sound. There also seemed to be a tribute to Steve Albini on the album. Steve Albini was famous for being the “master of the fuzztone.” He produced all of the noise band “The Jesus Lizard’s” album when they were on the Touch and Go label. Albini also had a noise band of his own called “RAPEMAN” (the name was taken from a Japanese comic of the same name). 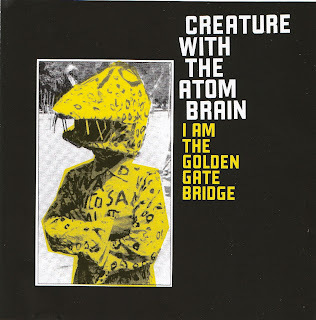 The track “Rapeman’s Scalp” from Creature with the Atom Brain had a lot of noise rock elements that the other tracks do not have. From what I can gather, “Is That Lady Sniff?” is the lead single. I say that because it is the only song with a video. The album version of the song is different than the version they used in the video. I thought that was really cool. It is something I have never seen before and it is a nice break form the mainstream. The album version is heavier and rocks harder than the soft, acoustic video version does. I Am the Golden Gate Bridge rocks harder than most music I listen to these days, but that does not make it any less good. I strongly suggest all of you buy it today. It is scientifically proven that it will make you cooler. Yes readers, grunge rock (or whatever you want to call it) is still going on strong. Thanks to the fine folks over at Sub Pop Records and the resurrection of the vaunted “Sub Pop Singles Club” where they send you vinyl of up and comers that they just signed. There have been many great singles to come from that (as well as a few duds). One single has always stood out as the best ever since I heard it. Despite being only the second single in the series, it is still the best. I am talking, of course of the band Unnatural Helpers. They are the same do-it-yourself no-nonsense style that came to summarize what was known as the grunge movement in the late 80s and that dominated all aspects of mainstream music in the early 90s. I got their single from Sub Pop in September. I have just about worn down the vinyl playing it so much. Thankfully, Sub Pop records come with download codes so you can download tracks to your computer and listen on yor iPod. Old school meets new school in a really cool way. I truly think this is the future in music. Anyway, back to Unnatural Helpers. They combnie punk and pop that hasn’t been seen since the earlier days of Mudhoney. They are fast and furious with their songs. The Singel had 4 tracks on it and it lasted about 6 Minutes. I was intrigued by them so I reached out to Sub Pop via Twitter to see if I can find out when the were going to drop their first album. They informed me that they already self-released an album in 2005. Doesn’t get anymore grunge than that. Hearkens back to the early days of Beat Happening. “Grunge” is more than a term to describe music form Seattle from 87-91. It is a style of music that breaks away from the mainstream. Strips out the overdubbing and overproducing and leaves you with raw emotion. That can happen at any time from any place. I hope that Unnatural Helpers are the start of the Grunge Revival the music and fans so desperately need.